I like books. Some of you seem to like books. Or at least you seem to like bookstore money. There are a couple of issues that come with liking books. 2. They cost even more money when you forget they're in your college backpack and fail to return them to Woodruff Library and then discover this lapse of memory when you are unpacking after buying your first home 5 years later. My apologies to Emory University. Trust me, no one will miss Interpersonal Process in Psychotherapy: A Relational Approach. It's better that I have it. Right, coworkers? Another challenge with liking books is storage. I have them in every room in my house. Bookshelved. Strewn about. Tucked away under guest towels. Everywhere. 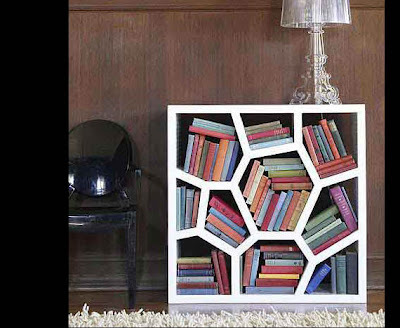 I imagine this bookcase resembles the organizational structure in my brain. I like that sitting on this bookcase seems to make you transparent. Transparent = thin. See the other 18 wonderful homes for your reading material at Incredible Things. 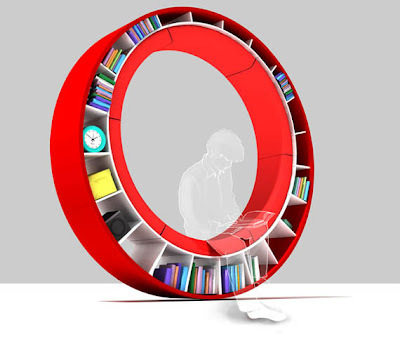 So, where do you hide all your books? Any neato ideas? We have book shelve, bedside tables, end tables, and kitchen tables for my books (Kara doesn't read as much as I do). 2. A Glimpse of Jesus, Brennan Manning. 3. People magazine. 100 (or 50?) Most Beautiful People. I didn't make the list this year either. I love that first book shelf! Holy crapballs that's awesome. The second one, not so much. I don't want to turn into The Invisible Reading (Wo)Man. Scary. I love the honeycomb one too! So neat! I keep my books all over the place. Stacked, in shelves, as decoration. I've seen them used as actually table legs and stuff, but I've never been brave enough to try it! J: That's a unique variety by the potty. CB: Maybe that is God speaking through my blog for you to open up a used bookstore. Yep, I am almost sure of it. MWIGU: I'm now going to start using "crapballs" in everyday conversation. Thank you. C: I think when you have a blog about reading then you most definitely should have a couch made of books.